Tangkuban Perahu, or Tangkuban Parahu in local Sundanese dialect, is an active volcano 30 km north of the city of Bandung, the provincial capital of West Java, Indonesia. 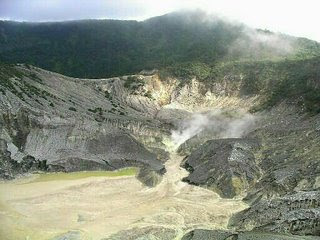 It is a popular tourist attraction where tourists can hike or ride to the edge of the crater to view the hot water springs upclose, and buy eggs cooked on its hot surface. This stratovolcano is on the island of Java and last erupted in 1983.